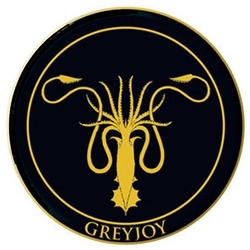 The House Greyjoy Embroidered Patch is stitched in the dreary colors of winter on this patch- a must have for any fan who wishes to show their allegiance to House Greyjoy. Patch measures 3'' in diameter. This will need to be sewn onto the article you are wearing.